Why pay someone else to take care of your accounting when you can do it yourself? FreshBook is an innovative and painless way to do business accounting in the cloud. Try FreshBooks free for 30 days and you’ll never look back, its really that great. 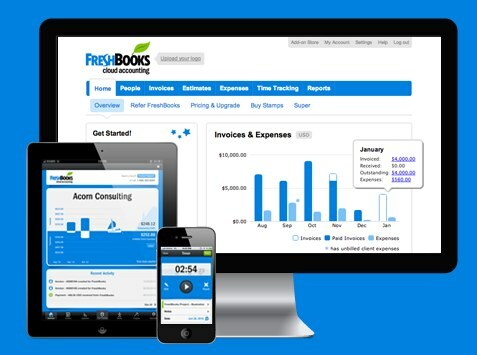 FreshBooks is the number one accounting software for small businesses in the United States. More than five million people use the software on a monthly basis and that number continues to grow. Use FreshBooks to track time, manage your expenses, and painlessly invoice your clients. Cloud accounting has become popular in recent years. It used to be that business professionals would either hire an expensive professional or try to work with outdated desktop software. FreshBooks is changing the way we do accounting. The website is laid out so that users can create invoices like a pro, track payments through their system, and even track expenses by importing information directly from your bank! Never worry about security at FreshBooks. The system is backed by a 256-bit SSL encryption and Cisco-powered firewalls. Plus the FreshBooks team is always scanning for potential vulnerabilities before any hacker could even try and get in. And don’t worry when tax time comes around next year, FreshBooks has your back. The software can pull a number of reports you may need with just the click of your mouse. The team at FreshBooks has made it as easy as possible, no need to stress out. With all the features available at FreshBooks, you’d be crazy not to try FreshBooks free for 30 days. The software is easy to use, you can work anywhere, you’ll save more time than using outdated desktop software, and there is a mobile version available on both the iPad and iPhone.